It is copyright © Robert Allen and Jacket magazine 2007.
that also marked the killing of millions. with ticking time, from New York to Berlin. at peace this summer day, for what it’s worth. to her blonde good looks. Rap is love and violence without history. cried their eyes out in irony. What once were artists, now are signs. were the atoms that skim the sea. all here in my head. I don’t know what it’s worth. I am increasingly alright. What would you want me to say? love to listen, even talk back, given half a chance. and the dust of randomness settling on the wooden sill. notes, a line of visible time, quiet as brushed cymbals. leaves a last six/four shower of rain shakes down. It might have been grey all day. a smoky tribute from their acolytes. its back and started to breathe. 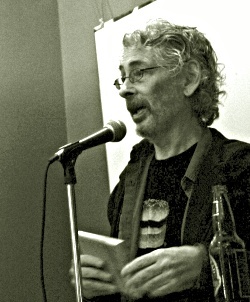 Robert Allen (1946–2006) lived in Montreal and Ayer’s Cliff in Quebec’s Eastern Townships and taught creative writing at Concordia University. He is the author of fourteen books of poetry and prose including the poetry collections Magellan’s Clouds (1987), Ricky Ricardo Suites (2000), Standing Wave (2005) and The Encantadas (2007). Born in Bristol, England he was educated at the University of Toronto and Cornell University. He was the editor of the longest-running Anglo-Quebec literary journal, Matrix, which has published and supported most of the other poets in this current survey.